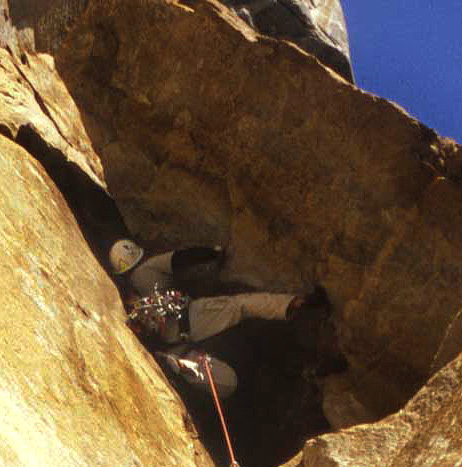 Located on the Southeast Base of El Cap. Park along the road in El Cap meadows (or whatever is available during construction). Walk to the toe of the Nose, then up and right, past the Alcove. You will see a pile of blocks, this is The Gollum. The climb is a long single pitch. Take a lot of gear, standard Valley rack through #3. But for the lower crux, load up on big stuff! 2 #4.5, #5, #6 is what I believe we had (which is pretty much all of the big stuff). This climb protects well with modern gear. My hat's off to Peter Haan though, who probably didn't have anything, really, and onsighted it, thinking that the rating was 5.9.... oh my! Gary pulls into the crux. The overhaning offwidth is the crux, for sure, but the route continues to deliver full value throughout it\'s length. At the crux, you move out under the roof, using edges for the right foot and hand, and the crack for the left foot and hands. You can see where you have to go, and you can't believe that it is possible. But correct technique in the crack gets you through the roof. Then you slowly rotate to your left into the edge of the crack. You think you\'re done, but the problems above keep you on your toes. This is a spectacular climb in my opinion.